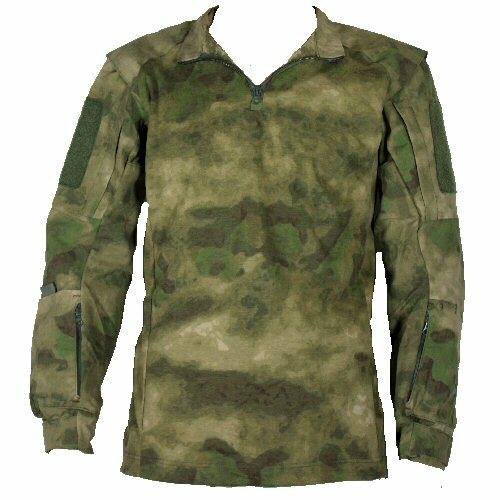 The Propper Inc UBACS shirt in ATACS is an innovative design which maximises movement and air flow, affords positive elbow protection, and helps to organise utilities over both arms. 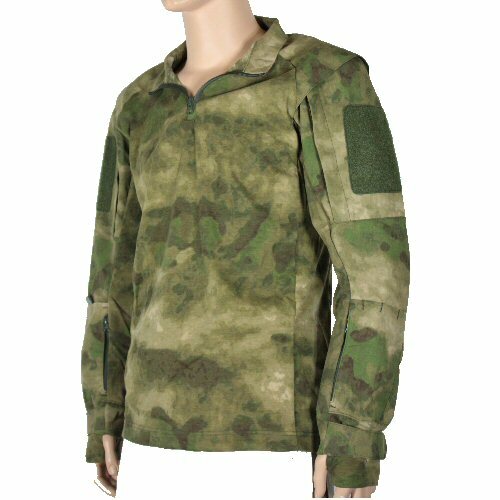 The shoulder is a two-piece integrated construction, with an over-layer of Battlerip fabric to cover the shoulders where armour carrier straps go, and an underlayer of stretchable, knit poly-cotton fabric for the shoulder and arm. 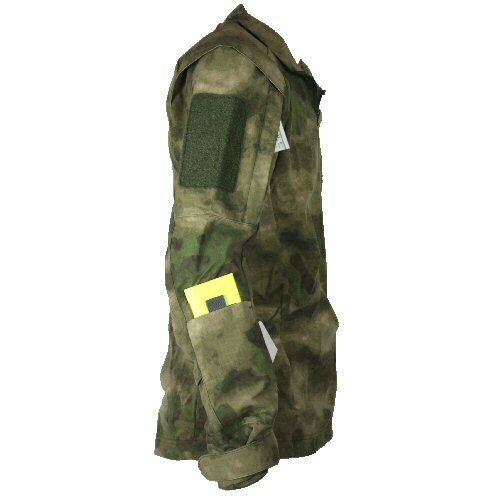 This maximises protection from rubbing and abrasion, but allows for excellent movement and also eases airflow between the armour and the shoulder. 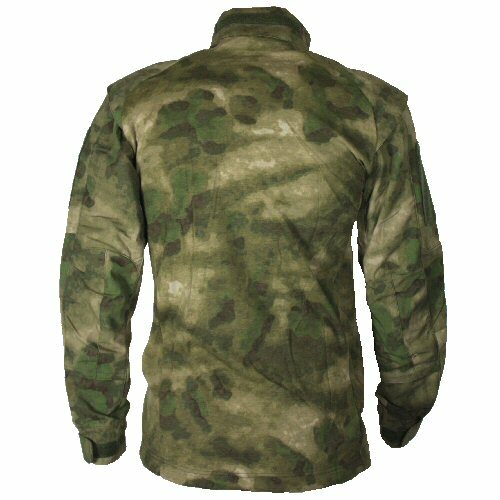 The knit poly-cotton fabric is breathable, and is also printed in authentic ATACS FG camouflage. This covers torso, chest and back, and is cut into the underarm to maximise breathability under the arms. A section of this fabric is also used as an internal cuff on each arm. This is fitted with a thumbhole to allow the shirt sleeve to be drawn over the knuckle and hooked into the thumb for protection from wind, sand and cold. The shirt zips with reversed quarter length zip into a profiled Battlerip fabric collar which is higher at the back and lower at the front. This reduction in the heavier weight fabric on the neck aids shooting when prone, without sacrificing protection for the back of the neck. 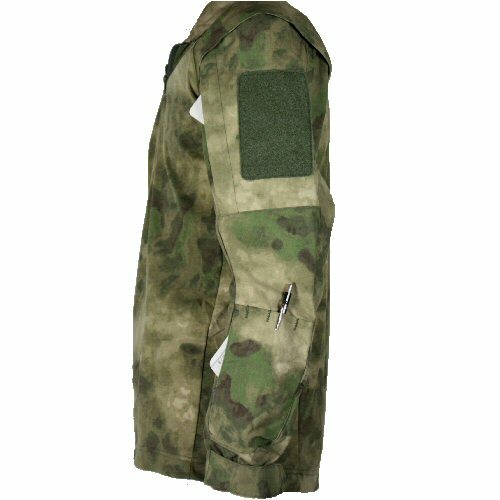 The back of the neck has a 25mm velcro strip for attaching name tapes or insignia above the armour line. Each sleeve comes with three pockets. The upper arm pockets are large and open with zippers. Velcro panels are attached to the outside of these pockets for insignia. The lower arm pockets are located to maximise ease of opening, and they open with a zipper. To the outside of the lower arm pocket is located a pen pocket on the left arm and a velcro open document pocket on the right. These pockets allow for easy and accessible storage of a great deal of small, but essential utilities. The cuffs close with velcro for maximal area of adjustment. The elbows are shaped and contoured to the bend of the elbow and can be opened to accept padding. 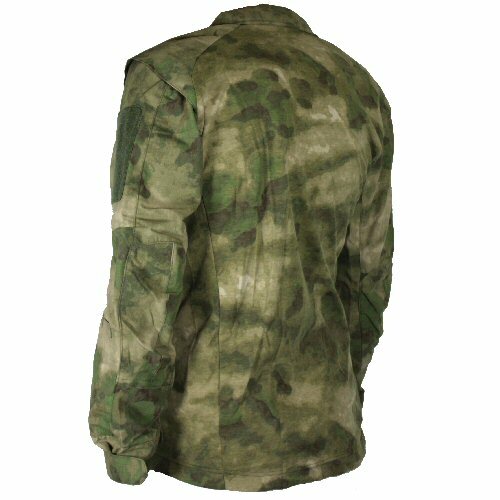 The Propper ATACS FG UBACS shirt is a well thought out, designed and battle tested item of clothing which offers more versatility than other UBACS shirts. Angled left view of the shirt, showing the zip pockets on the arms, velcro on upper arms and the two-piece shoulder construction. Also shown on the hands is the retractable inner cuff made of knit material. This has a thumbhole to enable it to be drawn over the knuckles. The left arm, showing the upper arm, lower arm and pen pocket. Left rear angled view, showing the profiled elbows. These open with velcro to accept padding. Rear view of the shirt with the collar up, showing the name tape on the rear. Right arm of shirt, showing the two zip pockets, velcro panel and the ID pocket on the right arm. This is closed with velcro for the full width.